Technician Piper Roberts (left) and geneticist Shannon Pinson look for disease symptoms after inoculation at the sheath blight disease nursery at Beaumont, Texas. Rice (Oryza sativa) is the main dietary staple for more than half the world’s population. In 2008, worldwide rice consumption exceeded 430 million metric tons. But the world’s continued rice supply is jeopardized by a myriad of factors, including diseases and inability to keep up with demand. 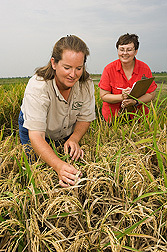 Since the Agricultural Research Service is a world leader in rice research, it’s no surprise that scientists at the Dale Bumpers National Rice Research Center in Stuttgart, Arkansas, and the Rice Research Unit in Beaumont, Texas, are involved in domestic and international efforts to improve rice varieties worldwide. As part of a multi-state and multi-institutional project called “RiceCAP,” supported by the USDA National Institute of Food and Agriculture, geneticists Anna McClung and Georgia Eizenga and plant molecular pathologist Yulin Jia, at Stuttgart, and geneticist Shannon Pinson, at Beaumont, are working to pinpoint the exact genes that confer resistance to sheath blight. The disease is caused by Rhizoctonia solani, a fungus that can stay in the soil for 20 years, killing the plant’s cells each planting cycle and affecting yield and grain quality. The researchers had a breakthrough in their sheath blight mapping efforts when they identified and confirmed that a particular region on a chromosome—known as “quantitative trait loci qShB9-2”—has a major effect on controlling the disease. 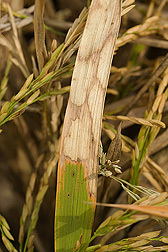 A rice leaf exhibiting typical watermark lesions associated with sheath blight disease. In a related project, Eizenga and colleagues screened wild rice species for signs of sheath blight resistance. Of the 73 wild species obtained from the International Rice Research Institute (IRRI) in the Philippines, 7 accessions showed the most resistance. The scientists have crossed some of these accessions with U.S. varieties lacking resistance, hoping to transfer resistance genes from these wild species to cultivated rice to create new germplasm. The researchers are currently working on mapping populations to identify the exact locations of these resistance genes. The Stuttgart group has also developed a standardized greenhouse-screening technique for accurate phenotyping of sheath blight. In this technique, called the “microchamber method,” 2-liter or 3-liter soft drink bottles are used to create a humidity chamber to promote disease development, allowing the scientists to measure the rice seedlings’ disease reaction in just 7 days. This has accelerated the overall process of identifying novel, resistant resources from cultivated and wild relatives of rice. The technology has since been transferred to several rice-research programs in Latin America to help countries evaluate their rice varieties for sheath blight and other rice diseases. 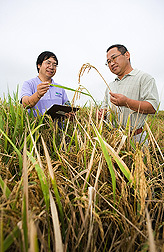 In a Stuttgart, Arkansas, rice field, ARS plant molecular pathologist Yulin Jia (left) evaluates sheath blight disease in a mapping population with his assistant Guangjie Liu, of the University of Arkansas. Meanwhile, in Beaumont, Pinson and colleagues have been studying gene-mapping populations developed from recombinant inbred lines (RILs) of Lemont, a domestic cultivar, and TeQing, a cultivar from China. Because each of these lines contains different combinations of DNA, they can be used efficiently to find chromosomal regions containing genes for resistance to sheath blight. Pinson has been able to find 18 chromosomal regions with genes that help plants resist damage from the disease. Two of those chromosomal regions have shown a large, measureable effect on sheath blight resistance and were associated with flowering time and plant height. 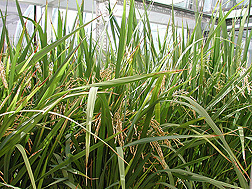 The Lemont/TeQing RIL gene-mapping population is uniquely important in that it has two high-yielding cultivars as parents, is the first to be well adapted to the southern United States and other semitropical growing conditions, and contains more progeny lines than other rice gene-mapping populations, which makes estimation of genetic marker locations more precise and evaluations of marker-linkages easier for breeders. Pinson has also teamed up with a scientist in the Philippines to develop a second gene-mapping population known as the “TeQing-into-Lemont introgression lines” (TILs), which consist of 123 genetic lines that each contain just 1 to 5 small pieces of TeQing DNA placed within a predominantly Lemont genetic background. This consistent genetic background surrounding the foreign TeQing genes allows researchers to more accurately measure the effect of each small piece of TeQing DNA. By looking at the trait expression of the TILs compared with each other and with pure Lemont plants, scientists can find genes having a small but significant impact and can determine their genomic location more precisely, which could help researchers improve worldwide rice production. Using the microchamber method, plant molecular pathologist Yulin Jia evaluates sheath blight disease of rice seedlings a week after inoculation with the fungus Rhizoctonia solani. Rice blast, caused by the fungus Magnaporthe oryzae, is a disease threatening rice worldwide. The fungus is airborne but is also transmitted through seed, infecting rice plants during all developmental stages. Strains of rice blast are always changing, making it a challenge to continually produce varieties resistant to it. But McClung, Jia, fellow geneticist Bob Fjellstrom, and colleagues have made a breakthrough in understanding the disease. The scientists have developed molecular markers to screen for resistance genes. They have also found the Pi-ta gene gives rice resistance to several races of rice blast. Recently, rice blast race IE-1k—a race to which Pi-ta doesn’t confer resistance—appeared in rice paddies in the southern United States. Jia and colleagues found genes Pi42(t) and Pi43(t), from the Chinese cultivar Zhe733, confer resistance not only to IE-1k, but also to all common races of rice blast found in the United States. According to Jia, breeders can overlap Pi-ta, Pi42(t), and Pi43(t) to increase cultivars’ longevity of resistance to rice blast. 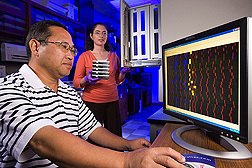 Geneticist Melissa Jia loads plates containing DNA from a sheath blight mapping population into an automated genotyping system while Guangjie Liu, of the University of Arkansas, analyzes the output to identify genes associated with sheath blight resistance. In addition to increasing yield and disease resistance, rice breeders try to ensure that the amylose content of a cultivar fits into a range that will provide a certain level of cooking quality. Starch amylose content is the key factor affecting the texture and processing properties of rice. And recent studies have correlated amylose content to “resistant starch”—which, after consumption, resists digestion in the small intestine. Resistant starch has been proposed to have health benefits similar to those of dietary fiber. Amylose levels help rice breeders decide how best to market a rice variety. The amylose content typical of U.S. long-grain rice ranges from 19 to 23 percent, giving it a dry, fluffy texture after cooking. The typical U.S. medium-grain rice, which has an amylose content of less than 19 percent, is soft and sticky after cooking. Rice with an amylose content higher than 23 percent is used for canning. 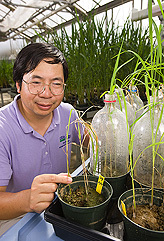 “When rice breeders ask about the grain quality traits of a possible new rice germplasm source, amylose content is one of the traits that is looked at carefully,” says Beaumont chemist Ming-Hsuan Chen. 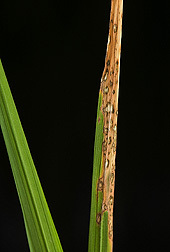 A diseased rice leaf 1 week after inoculation with the rice blast fungus Magnaporthe oryzae under greenhouse conditions at Dale Bumpers National Rice Research Center, Stuttgart, Arkansas. But there is a problem: The reported amylose content might not actually be the amount that the breeder is looking for. This is because the test to determine amylose content is not standardized worldwide, so test results vary from country to country—even for the exact same variety. For example, in 2009 the rice cultivars Kyeema and Doongara were reported to have amylose contents of 14 and 22 percent, respectively, in one country, 19 and 24 percent in another, and 20 and 28 percent in yet another. “Such differences make it particularly difficult to exchange germplasm between breeding programs, present data to international audiences, or make associations between amylose values and traits or genotypes,” says Chen. Each year, thousands of rice samples are analyzed at the Beaumont laboratory for amylose content and other critical end-use quality traits. The scientists there have standardized their method of determining amylose content so that the values are repeatable year after year. Chen has joined the International Network for Quality Rice and collaborates on a project led by IRRI’s Melissa Fitzgerald and commissioned by the International Union of Pure and Applied Chemistry. The goal of this project is, through worldwide collaboration among rice quality labs, to establish a standardized test for amylose content determination internationally. “The exchange of plant germplasm and genetic stocks helps to identify genes and genetic markers that can be used by rice breeders globally to develop new cultivars that will sustain agriculture and help feed the world,” says McClung, research leader of both the Stuttgart and Beaumont laboratories. Scientists in Stuttgart received several wild rice species collected from rice-growing regions around the world and stored at IRRI to help identify novel disease-resistance genes. In return, Stuttgart scientists sent IRRI about 400 purified rice cultivars representative of rice grown around the world, which can be used to identify markers associated with traits important to rice production practices in Asia. Additionally, ARS, the University of Arkansas, and IRRI have an ongoing informal collaboration to identify genes and plant traits that will contribute to the development of high-yielding rice cultivars with disease resistance. In another project, ARS is working with IRRI and Cornell University to develop 600,000 genetic markers that can be used to identify genes that control yield, grain quality, and resistance to physiological stress, insects, and disease in rice cultivars from around the world. Such work ensures that people worldwide will be able to enjoy rice for years to come.—By Stephanie Yao and Alfredo Flores, Agricultural Research Service Information Staff. This research is part of Plant Genetic Resources, Genomics, and Genetic Improvement (#301) and Crop Protection and Quarantine (#304), two ARS national programs described at www.nps.ars.usda.gov. To reach scientists mentioned in this article, contact Stephanie Yao, USDA-ARS Information Staff, 5601 Sunnyside Ave., Beltsville, MD 20705-5129; (301) 504-1619. Golden Rice-2 plants growing in a greenhouse. All across America, rice has a loyal following among those who enjoy crispy rice cereal at breakfast, steamed white rice with a favorite entree at lunch, or a classic rice pudding as an evening dessert. But America’s consumption of rice—about 21 pounds per person each year—is substantially less than that of people who live in the world’s “rice-eating regions,” mainly Asia, most of Latin America, and much of Africa. Because vitamin A deficiency—and its harmful impacts on health—is common in some of these overseas areas, scientists in Europe and the United States have worked for more than a decade to genetically engineer white rice so that it will provide beta-carotene. Our bodies convert beta-carotene into retinol, a form of vitamin A. White rice typically does not have any detectable beta-carotene. But the genetically engineered Golden Rice-2 from Syngenta Corporation does. Until now, however, scientists haven’t known how efficiently our bodies can convert the beta-carotene in Golden Rice-2 into retinol. Research published in a 2009 issue of the American Journal of Clinical Nutrition provides a scientifically sound answer. Agricultural Research Service plant physiologist Michael A. Grusak, carotenoids researcher Guangwen Tang, and colleagues reported, for the first time, their findings that one 8-ounce cup of cooked Golden Rice-2 provides about 450 micrograms of retinol. That’s 50 to 60 percent of the adult Recommended Dietary Allowance of vitamin A.
Tang, who led the study, is at the ARS Jean Mayer USDA Human Nutrition Research Center on Aging at Tufts University, Boston, Massachusetts; Grusak is with the ARS Children’s Nutrition Research Center at Baylor College of Medicine in Houston, Texas. ARS, the National Institutes of Health, and the U.S. Agency for International Development funded the research. The scientists based their determinations on tests with five healthy adult volunteers who ate one serving of the rice at the start of the 36-day study. Volunteers’ blood was sampled at more than 30 intervals during the research. By analyzing those samples, the researchers were able to determine the amount of beta-carotene (and retinol) that the volunteers absorbed (and then converted to retinol) from the Golden Rice-2. The efficient conversion of Golden Rice-2 beta-carotene into vitamin A strongly suggests that, with further testing, this special rice might help reduce the incidence of preventable night blindness and other effects of vitamin A deficiency in rice-eating regions. Right now, more than 200 million people around the globe don’t get enough vitamin A.
Grusak conducted experiments that made it possible for Tang’s group to detect beta-carotene (and resultant retinol) derived from Golden Rice-2, differentiating it from beta-carotene or retinol from other sources. In his experiments, Grusak determined how to get Golden Rice-2 plants, grown in his rooftop greenhouse at Houston, to take up a harmless tracer and incorporate it into the beta-carotene in the developing grains. The tracer, a rare yet safe and natural form of hydrogen, can be detected by a gas chromatograph-mass spectrometer, the kind of instrument that Tang’s team in Boston used to analyze volunteers’ blood samples. The tracer, deuterium oxide, is not new to vitamin A research. But Grusak’s studies are the first to show how the tracer can be successfully incorporated into the grains of a living plant for vitamin A investigations. “It was tricky to determine how much tracer to use and when to add it to the nutrient solution we grew the plants in,” says Grusak. His method might be used in other pioneering research geared to boosting the nutritional value of other grains worldwide.—By Marcia Wood, Agricultural Research Service Information Staff. Michael A. Grusak is with the USDA-ARS Children’s Nutrition Research Center at Baylor College of Medicine, 1100 Bates St., Houston, TX 77030, (713) 798-7044. Guangwen Tang is with the ARS Jean Mayer USDA Human Nutrition Research Center on Aging at Tufts University, 711 Washington St., Boston, MA 02111, (617) 556-3236. "Improving Rice, A Staple Crop Worldwide" was published in the May/June 2010 issue of Agricultural Research magazine.